Garage Gate Remotes businesses highly value the strong relationships we have with our customers. Often these relationships have been built up over many years. The gradual introduction of data collection technology at Garage Gate Remotes will be handled with full and proper respect for the privacy of our customers. To protect your privacy, you can visit Garage Gate Remotes site without identifying yourself or having to reveal any information about yourself. Garage Gate Remotes is committed to reducing the amount of fraud it faces. Our policy is that we will prosecute any cases of fraud that we identify. As a first time customer, you may receive a telephone call or email requesting more information/proof to confirm the details that you have supplied to us. If any of the information you supply is found to be false or misleading, we will, if we deem it appropriate, report this to the appropriate authorities for them to prosecute. Our site contains links to other sites. 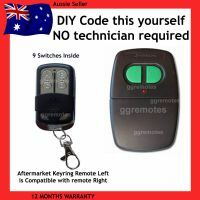 Garage Gate Remotes is not responsible for the privacy practices or the content of other websites. Garage Gate Remotes was involved in the development of and fully supports the 'National Privacy Principles for the Fair Handling of Personal Information' launched in February 1998. As part of these principles, customers who do not want to receive marketing offers through the mail or on the internet can contact us on 0417 202 548. As the Federal Government introduces new privacy legislation - Garage Gate Remotes ‘s privacy policies will be reviewed and updated as appropriate. For credit card transactions Garage Gate Remotes adds security by using Secure Sockets Layer (SSL) technology. This means that the credit card information you send is encrypted by your computer, and then decrypted again on our side, preventing others from accessing your private information in between. So, when using an SSL capable browser, shopping on Garage Gate Remotes website is the safest kind of transaction possible with a credit card. Garage Gate Remotes has found that attractive, graphics-rich emails are a quick, effective and low-cost way to communicate with customers and prospects about new high tech products, clearance and auction items. We maintain an opt-out, user-customisable subscription service of email addresses of people requesting promotional emails. Changes to your contact, invoice and delivery details can be made using the Account Information section of www.garagegateremotes.com.au. Subscribing, unsubscribing or changing your subscription preferences can be made using the Account Information available anyone with a Garage Gate Remotes account.